Just like us plants require a good supply of water and nutrients in order to thrive. Water is essential in the plant for a number of reasons. - Inter-cellular water evaporation can also act as a cooling mechanism to maintain plant at a temperature favourable for metabolic processes. 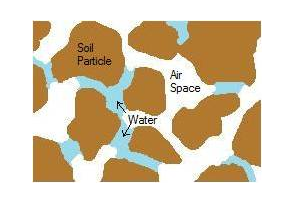 Agricultural soils are full of tiny pores (holes) like a sponge, and just like a sponge these pores (and the surface of the particles that make up the pores) can hold water. This water can be extracted by plant roots as they grow through the soil. When a soil is holding lots of water the plant can easily draw out the water, as less and less water is present it becomes increasingly difficult for the plant to draw water. When plants are starved of water they will adopt water saving measures to reduce transpiration, the result is the metabolic rate of the plant is reduced. This causes a reduction in the rate of plant growth and restricts the yield of the crop being produced. Eventually if the soil becomes too dry the crop will no longer be able to sustain itself and will die. Most growers understand the benefits of irrigating high value crops but many irrigation decisions are based on "kicking the soil" or inaccurate water balance methods. By deploying accurate, in-field sensors to monitor the changing soil moisture conditions in your crop you can determine when, and how much irrigation a crop needs to keep it growing to reach its full economic potential. 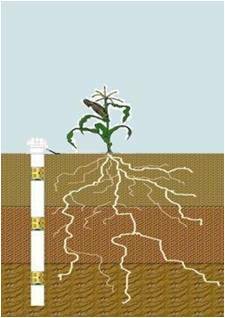 Once you decide to irrigate you need to ensure your application does not exceed the absorbsion capabilites of your soil. If you water potato ridges too rapidly the ridges will shed much of the irrigation and the crop roots will remain parched. Remember a heavy rain storm may produce 5-10mm of rainfal per hour, a boom can apply 25mm in just 2 minutes. Only by collecting continuous, in field, multi-depth soil moisture data can you really know what is happening in your soil profile and make informed irrigation decisions.